The earliest report we have found of cricket at Yarraville Gardens was in 1903 in the Footscray Independent when Sugar Works Benefit Society was to play AOB “near Yarraville Gardens”. This is likely to have been played on the flat land now known as Gary Greelish Oval. 1911 report in the Independent of a game in Yarraville Gardens. ​So cricket was played on our bottom ground long before our club was formed. The Yarraville Gardens and the bottom ground predates the top ground by around 50 years. The top ground, Hanmer Reserve, is a former quarry site which was next to the original Yarraville Gardens. Board of Works plan from 1895. ​We do not have many old records or photographs of the club. The Honour boards only go back to season 1966-67 and some old records may have been lost in the fire that destroyed the old clubrooms (see below). We do have one photograph of the Seddon Imperial Cricket Club, the club’s original name. It was taken in season 1933-34 and was presented to the Club Treasurer Mr R Wilson “as a token of esteem”. The photo shows 18 players in whites (there were firsts and seconds then) and two officials, one being the Club President Councillor D W Thompson, who served as a Mayor of Footscray. Seddon Imperial Cricket Club, the club’s original name -1933-34 season. ​1933-34 was a significant season for the club because it was our last in the North Suburban Cricket Association as Seddon Imperials. We had a team in the competition’s First Grade and the seconds were in the Third Grade, Section D. In May 1934 Seddon Imperials was reported as being one of a number of clubs of the 98 in the NSCA that would support the first grade moving to turf. The Victorian Junior Cricket Association (VJCA, now VTCA) which was formed in 1903 introduced a turf grade in 1930-31. In 1934-5 Seddon entered two teams in the matting sections of the VJCA. The following year Hanmer Reserve was opened and we moved to the turf section of the Victorian Junior Cricket Association (1935-36). The reserve was named after Footscray Councillor Edward Hanmer (Mayor of Footscray 1931-32, 36-37) who was president of our club in 1930s and 40s. In 1937-8 the turf section of the VJCA was divided into two divisions, “Seniors” and “A Division”. Subsequently the latter was divided into A North and A South sections. From ‘Footscray’s First 100 Years’. The Argus, 7 October 1935. The first clubrooms at Hanmer Reserve were near the current rooms. The building was an old timber house which was destroyed by fire in 1961. The Club took a pro-active approach and along with other clubs using the rooms, raised money for new clubrooms (the present change rooms and kitchen area). The Council assisted by granting a 15 year lease to the occupying clubs. Then in 1981 the football and cricket clubs financed the addition of the social and bar area to the building. In 1951-52 the firsts were runners-up to Clifton Hill in North A and the seconds were runners up to East Malvern. The following season, 1952-3, we won our first flag in the VJCA when the firsts defeated Newport in North A leading to promotion to the Senior Division. The seconds won the flag in 1953-54 defeating Black Rock (Seddon 165 & 290; Black Rock 37 & 112). The firsts, captained by Bruce Owen, won the flag in 1955-56 by defeating South Yarra in the North A in a close, low scoring match (Seddon 80 & 138; South Yarra 89 & 107). It is said that the cricket club was established in 1924 but the earliest report of Seddon Imperials fielding a cricket side was in October 1925 when we decisively defeated Pascoe Vale in the Third Grade of the North Suburban Cricket Association. The Argus, 12 Oct 1925. ​The oldest annual report we have is dated 28 July 1938. It is numbered the 13th annual report which seems to support the foundation of the cricket club being 1925 rather than 1924, unless a year was missed. But the club as a sporting body may be much older as Seddon Imperials seems to have started as a football club first. The earliest report so far found has Seddon opening the 1910 football season by beating Flemington Boys Fire Brigade 4 goals 3 behinds to 2 goals 4 behinds. They went on to win the flag by beating Reliance at Albert Park, 5.10 to 1.5. They were runners-up in 1911. In the 2016/2017 season the Dockers achieved a Grand Final victory, beating Sunshine United by 241 runs at Laverton. The win featured a historic innings from Ben Speake who scored 216, a club record. The match was scored by Seddon's own Charlie Carey. You can download a copy of the scorebook to see the whole match in detail. 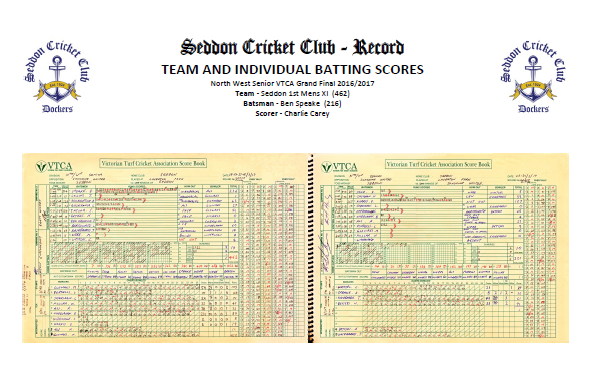 Do you have information or photos to contribute to the historic records of the Seddon Cricket Club?